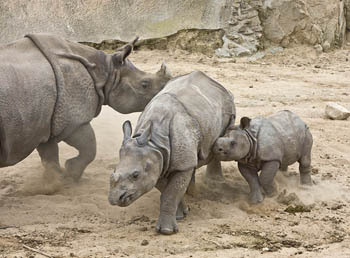 Caption: Jontu, male baby Indian one-horned rhino (Rhinoceros unicornis) feels frisky as he challenges female juvenile rhino, Shanti, in play fight while his anxious mother, Jakichu, looks on. Comments: Jontu, male baby Indian one-horned rhino (Rhinoceros unicornis) feels frisky as he challenges female juvenile rhino, Shanti, in play fight while his anxious mother, Jakichu, looks on. Central Asia Region of San Diego Wild Animal Park, California, USA.